“It was Ruth Thomas’s firm position that she belonged nowhere but on Fort Niles Island. This was the position she took with her mother: she was truly happy only on Fort Niles; Fort Niles was in her blood and soul; and the only people who understood her were the residents of Fort Niles Island. None of this, it must be said, was entirely true. It was important to Ruth in principle that she feel happy on Fort Niles, although, for the most part, she was pretty bored there. She missed the island when she was away from it, but when she returned, she immediately found herself at a loss for diversion. She made a point of taking a long walk around the shoreline the minute she came home (“I’ve been thinking about this all year,” she would say) , but the walk took only a few hours, and what did she think about on that walk? Not much. There was a seagull; there was a seal; there was another seagull. The scenery was as familiar to her as her bedroom ceiling. She took books down to the shore, claiming she loved to read near the pounding surf, but the sad thing is that many places on this Earth offer better reading envirionments than wet, barnacle-covered rocks. When Ruth was away from Fort Niles, the island became endowed with the characteristics of a distant paradise, but when she returned to it, she found her home cold and damp and windy and uncomfortable. Elisabeth Gilbert is being compared to John Irving, and I can recommend this book for the sheer joy of the language she uses to bring her characters and the island they inhabit to life. 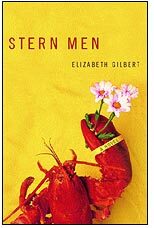 Elisabeth Gilbert: Stern Men. Houghton Mifflin, 2000. Eat, Pray, Love. One Woman’s Search for Everything Across Italy, India and Indonesia. 2006 (Nonfiction; her travels after her divorce). The Last American Man. Viking 2001 (Nonfiction; working on a dude ranch). Pilgrims. Houghton Mifflin 1997 (Stories). How about signing up for a conversation course? It is easier to start a new project at the end of the summer than at the beginning of a new year. I’ll be updating this blog from Drummond Island, but the Island Weekly podcast is taking a break and will start up again in September.